You woke up one morning and thought, it’s time to get rid of that laminate floor, replace that Formica counter, upgrade the bathroom, or just do an addition to make our kitchen bigger, better, and bolder. But how do you start? Where do you go? When do you go? Don’t worry, you are not alone. 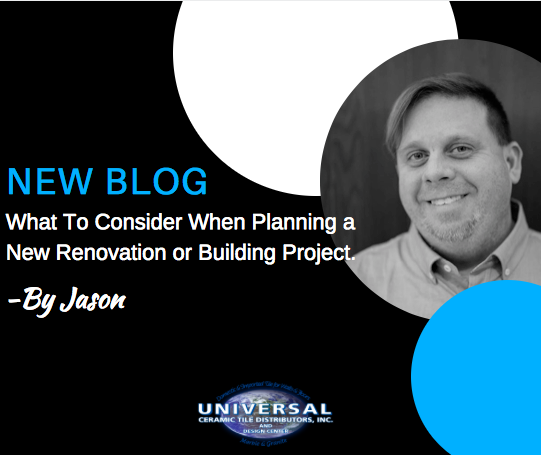 Everyone encounters these same questions when they are starting out on a new renovation or building project. And this is where we come in to help you find and make your dreams come true. Visit reputable sources for your materials. A “heck of a deal” doesn’t always equal out to a beautiful finished product. Remember, you wouldn’t go to a dodge dealer to get your teeth worked on. Make sure you and your contractor discuss responsibilities regarding material, costs, and time frames. Your contractor/installer/builder wants to get the project done and so do you, and this process will help to make that happen. DONE FORGET TO ENJOY THE PROCESS! Most of all, have fun with it. Remember, upgrading your living space should be enjoyable and not filled with stress and pressure. Smile often, do what makes you happy, go with the look that you love. After all, what good is an upgrade if you don’t enjoy the outcome? Don’t forget to come on down to Universal Ceramic Tile at 301 Murphy Road in Hartford CT and talk with all of us on the design team. We will help you find what you are looking for and make your experience fun and exciting!